Enjoy top-of-the-line amenities and a smooth ride every time you get behind the wheel of the 2018 Nissan Sentra. The new Sentra sedan offers an impressive array of interior comfort options and modern entertainment and safety technologies, making your morning commute more enjoyable. Come to our Nissan dealership near Aurora, IL, to learn more about your Nissan financing options and how you can buy or lease a 2018 Nissan Sentra! The 2018 Nissan Sentra offers inspired yet efficient performance at every turn. You have a choice of three engine options, so you can prioritize whether you want more power or improved fuel efficiency. Spring for the 188-horsepower turbocharged engine and zip down Illinois’ highways and byways. Or, you can select the 1.8-liter powertrain that allows you to earn up to 37 highway mpg. Enjoy a sportier, responsive drive with a 6-speed manual transmission or opt for the smooth-shifting Xtronic CVT®. Want to buy or lease a 2018 Nissan Sentra? 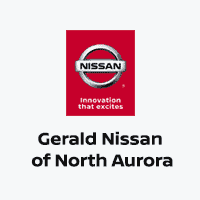 Head over to Gerald Nissan of North Aurora and speak with our Nissan finance team about your options!